I have never heard of Robert Benson before but apparently he has written a number of books. He has written and published so many that many people have asked him for advice on how to write for themselves. This book is an answer to their questions. 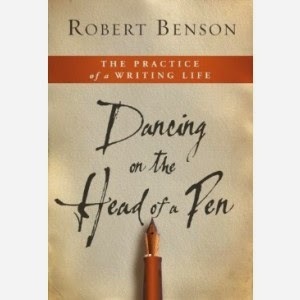 Dancing on the Head of a Pen is a very quick and easy book to read. It comes off as more of a motivational speech than anything else and motivational speeches always do tend to go down well. In other words, there are no "ouch!" revelations inside, unless you come to the realization that you are an incredibly undisciplined person (which I am going to bank on you already knowing if you know you want to write but haven't written anything yet). The short answer to the question of how to start writing is simply to do it. I have a lot of lawns to mow and laundry to do for others! "Any writer should have a shelf of . . . books. He need not read the writers I read. But he should never forget that we are all going to write under the influence of someone. Better for him if those writers are better than most. At the very least they should be the ones who make him want to lie down and take deep breaths before taking up his pen. Those are the books that will make him live, and write, more intensely. Reading anything less will not help him grow as a writer. A direct relationship exists between the caliber of the writing you read and the caliber of the writing you make." I agree with him whole heartedly! The people who I read definitely influence the life that I live and, frequently, the way I write. You can tell who I read - I think - if you read a few of my blog posts. Sometimes I think other authors are screaming through me in my speech and writing patterns. So, friends, let us read well so that we may be influenced by the wisest and the best! I do envision myself writing a book someday. As my first title has flitted away, I'll have to do some additional thinking and pondering. I know that writing is an important way for me to be able to express myself and that I feel calmer and more thought through once I write something down, whether it be for public consumption or personal release. Words matter deeply to me and the order they are placed in can change a world (or, at least, a life). It's interesting for me to pick up books every now and again which talk about how one can write more effectively. For me, writing is a "future thing" but reading Dancing on the Head of a Pen did encourage me to start practicing now. I pulled out a notebook and got started. Many thanks to Waterbrook Press for sending a copy of this book my direction in order to facilitate this review. I did not receive any additional compensation for this review and all opinions are - forever and always - 100% my very own! Interesting. From the title I never would have guessed this was a book about writing. It sounds good: I think I'll add it to my TBR list. The hardest thing is making time around other family obligations, but other writers I read have those as well. I've been praying that if this desire is of the Lord, that He'll show me how to go about it. And I definitely agree that the writers we read greatly influence the writers we become - as well as the rest of our lives. Neither of my libraries have this, so I'll have to seek this one out elsewhere. One of my recent classes,in particular, motivated me to write and see what I can do. I did. For a couple months. Then Little League began. Now we're busy enjoying summer...being away, having company, playing Uno, checking the birds' nest...you know...all those important things of summer. However, I DO want to write. I want to write for magazines. I also have an idea for a children's book in my head. We'll see if it ever comes to fruition. Quite honestly, I am not certain you need a brand new title. I know it's very specific, but if you aren't going to publish for another 5-10 years, it may be fine. Sometime google how to write a nonfiction book. You may be surprised at how simple it may be to come up with your 70,000 (or whatever it may be) word count. At least it sounded simple to me when I took my class. But the tale so runs that his sister, in a fey mood, called out to him; 'what?! Dost think that our mother will not hear, and hearing, punish?'" "So, friends, let us read well so that we may be influenced by the wisest and the best!" I have always thought, in the back of my mind, I would love to write a book. However, I don't have formal training, so its only been a thought. I am encouraged my most books I read. The closest I've come is to do reviews, which I enjoy. Sounds interesting. I read his book Living Prayer a year or two ago after it was recommended in a different book I was reading. Sounds interesting. I used to aspire to write a book (or books). . .however, the older I get, the less I think I know and the less I feel I have to offer! And while I might like to say I simply don't have time to write, I suspect the truer reason, as you alluded to, is that I simply don't have the self-discipline. I can't even seem to write a decent blog post these days! I was seriously JUST telling John that my new goal was to spend a few minutes (ease myself in with minutes rather than hours) a day writing. And then I read this post. Yes, discipline is necessary!